A Big Thank You to a dear friend, Thu, for getting me great pictures and video!! 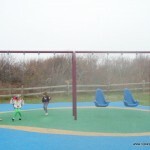 4/20/2011: Beautiful large playground within walking distance from the beach and ocean. 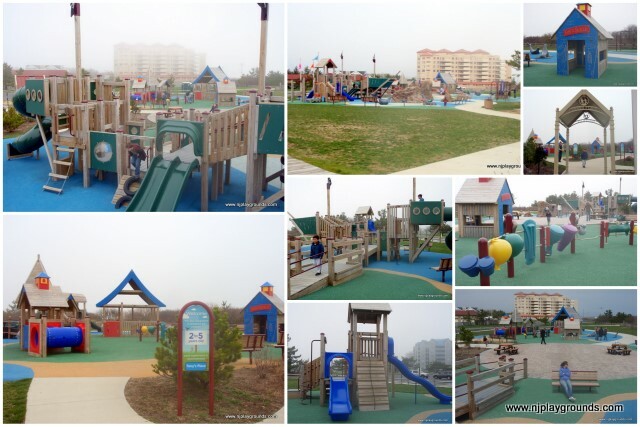 Left area is for 2-5 y/o while Right area is for 5-12 y/o. 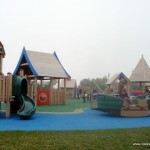 Colorful rubber foam floorings covering these two play areas are comfortable, safe for kids, and prevent rain muddy dirt. The center section is an open brick surface with picnic tables and benches, great place to observe both play areas, take a break, eat your own snack/lunch. Today, there is 1 porta-potty right at the playground. 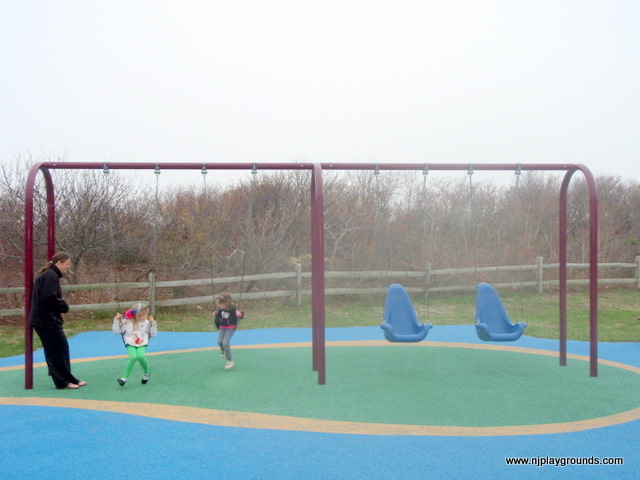 During beach season, there are bathrooms in the information center and main entrance of the park, walking distance from this playground. 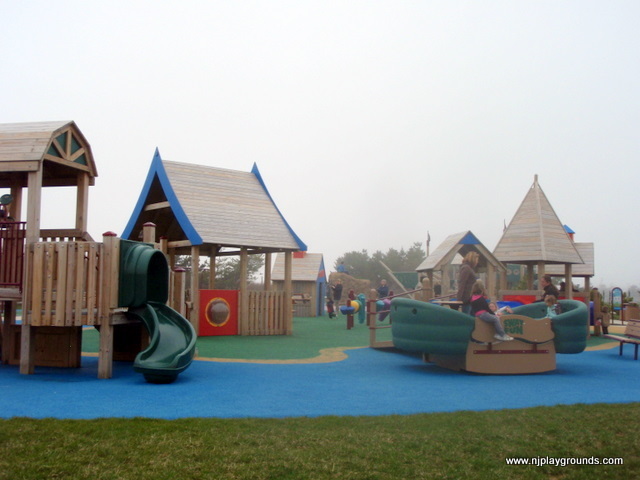 The 2-5 play area: crawl through tunnels, tic-tac-toe game, alphabet board, sway boat, 2 wooden playhouses with slides and open freeplay, tackle/ice cream shop, creative instruments including drum and shakers. In the back are baby swing, big kids swing, and what looks like a circular trampoline swing. 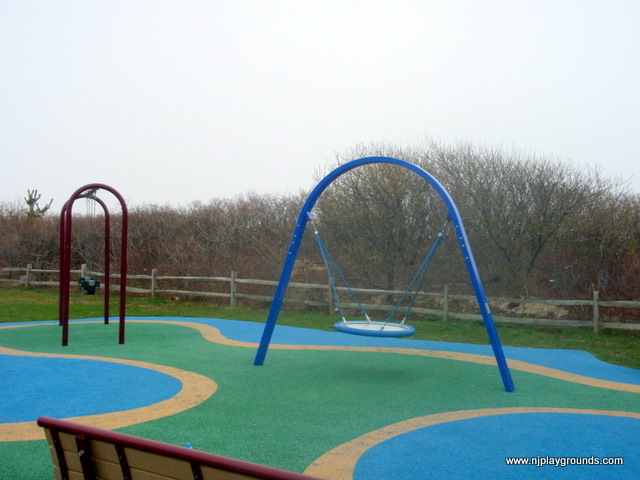 Kids can also sit on sea animals like dolphins and seals figures throughout the playground. 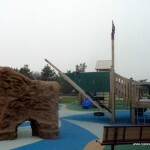 The 5-12 play area: 1 huge playhouse with tunnel slide and 3 tire climbers onto pirate deck, another playhouse features rope climbing to the top and higher slide to the bottom. 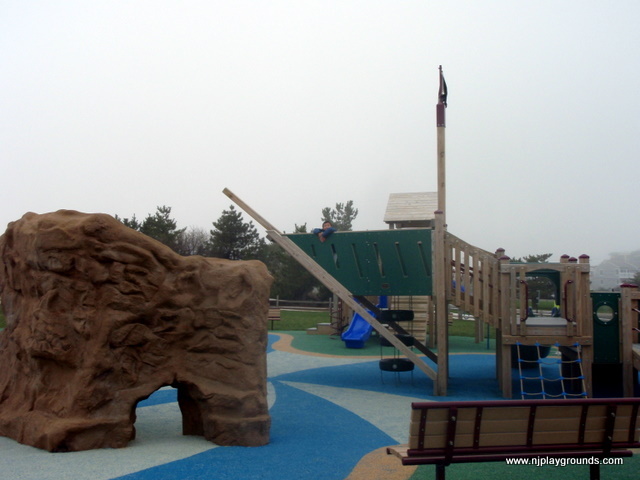 Kids can climb on the small rocks or large mountains. Then take a spin on the 3 spinners. 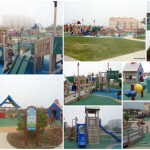 Nearby, there is short walking path from the playground leading to the gorgeous beach and Atlantic Ocean. Please change the address for those using gps and smart phones. It actually comes up as Seven Presidents Park Kiernan Blvd, Long Branch NJ 07740 My wife and daughter almost left the area for another park, because my iphone took me to an address down the beach a distance, where Hurricane Sandy had wiped out part of the beach. 221 N Ocean Ave takes you to the wrong location. 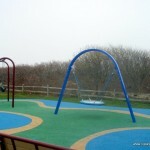 Is there a fee or a pass needed to go to this park? I see a park access pass on the website but not sure what it is for. I’m not from the area but would love to go but don’t want to get all the way there and not be prepared. I’m aware parking will most likely have a cost.